The legendary soft, pink sands and gentle aquamarine waters are the reason why this Bermuda honeymoons are oh-so popular. A Bermuda honeymoon is a top pick for couples searching a tropical destination that’s also rich in history. Due to its warm, comfortable climate and natural topography, Bermuda honeymoons are top-notch for water sports enthusiasts. Also, its colonial history has resulted in a unique blend of British and American cultures, evident in the nation’s architecture and refined traditions. So, if you’re hoping to find a destination that’s filled with unique places to explore and surrounded by pretty pink sand beaches, then you should opt for a Bermuda honeymoon. Plan the ultimate Bermuda honeymoon by checking out this helpful guide. Though Bermuda is warm year round, May to October is the busiest and most expensive season, when waters are ideal for swimming in. June to November on the island presents hurricane season which can spell trouble for Bermuda honeymoons. Horseshoe Bay: Consistently ranked as one of the world’s finest beaches, the crescent shaped Horseshoe Bay is coveted for its powdery pink sands and rocky Port Royal Cove. Bermuda Botanical Gardens: This arboretum contains a collection of lush themed gardens, guiding visitors through 35 acres of cheerful hibiscus, ornamental shrubbery, and exotic trees. 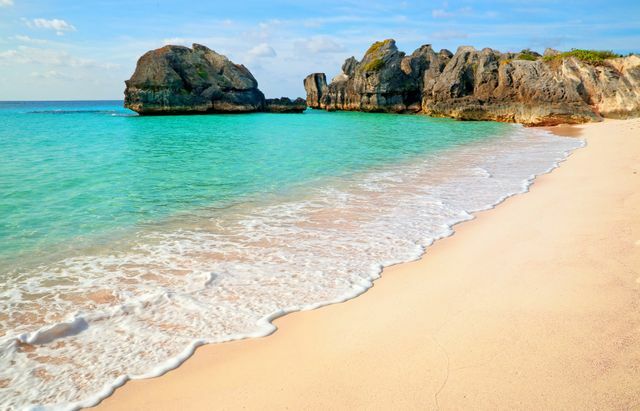 Elbow Beach: Blanketed by pink sands and its aquamarine waters teeming with marine life, Elbow Beach is an ideal destination for snorkeling during your Bermuda honeymoon. Royal Naval Dockyard: Embark with on a walking tour of the Royal Naval Dockyard with a knowledgeable guide and explore the British military’s largest naval base at one point in history. Unfinished Church: Incomplete due to insufficient funding, this oddly romantic and crumbling Gothic style structure features soaring arches and only the sky as its rooftop. Crystal and Fantasy Caves: Its walls adorned with crystallized stalactites and stalagmites, these two underground caves are worth a visit for their dazzling natural formations and azure blue waters. National Museum of Bermuda: Explore over 500 years of Bermuda’s maritime history and heritage through displays of shipwreck artifacts and diverse exhibits. Gibbs Hill Lighthouse: Reach the top of Gibbs Hill Lighthouse in 185 steps and soak in the stunning panoramic views of the island. Fort St. Catherine: Bermuda’s largest fort, Fort St. Catherine houses an impressive collection of antique weaponry, and illustrates life on the island in the 17th century. Bermuda Craft Market: Explore the island nation’s culinary landscape by sampling locally crafted delights such as rum cakes, coffee and beer—ideal for buying souvenirs during your Bermuda honeymoon. Queen Elizabeth Park: Paved pathways flanked by cheerful flower beds and graceful sculptures make this an oasis of calm and a favorite green space for locals. Tobacco Bay Beach- Characterized by jewel-toned waters and towering limestone pillars, Tobacco Bay Beach is a favorite for snorkeling and its beloved Friday night bonfires, which feature happy hour specials and live music.